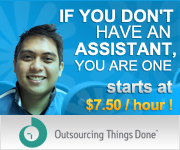 Are you thinking about a virtual assistant for your business? A web designer? Programmer? Other needs? Or if you just have questions about how this process works, drop your information below and an OTD team member will contact you right away to go through your questions and concerns.